When five-year-old Sabre Fazel said he wanted to bring hope to the children living on drought-affected farms, no one could have predicted that this simple idea could have such a big impact. But Sabre’s mum, Sarah Yip, decided they would take the idea and run with it, and the Parcels of Hope project was born. “He [Sabre] had been talking to us about the drought because he had been watching it on the news,” Ms Yip said. “He asked whether he could send the farmer children something to let them know that he cares,” she said. Ms Yip said the idea behind the project was to connect kids in the city with kids in the country to show them that someone out there cares how they are doing, and to offer some kind of support. “Specifically, we are collecting letters to connect the children, from the city to the country,” she said. 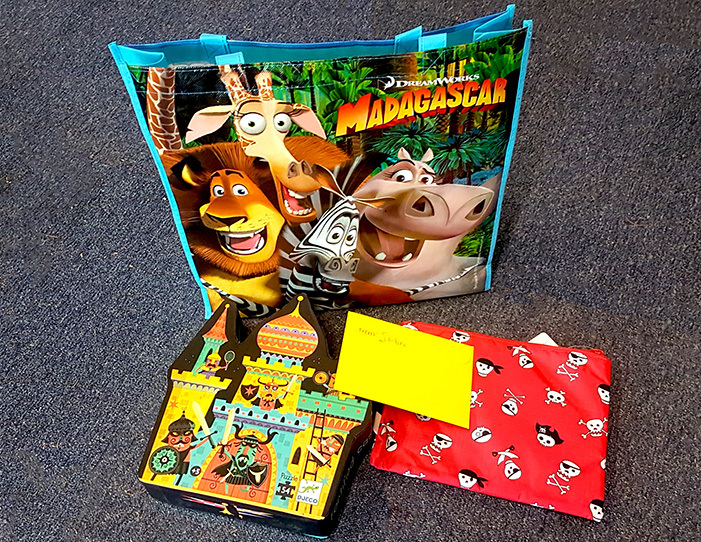 Sabre’s parcel contains a puzzle, a pencil case and letter with a stamped return envelope so that the recipient of his gift can write back. Sabre’s letter also contains an invitation of friendship and the hope that he may one day meet the recipient of his parcel. In addition to Sabre’s letter and gift, Ms Yip said they had collected parcels from a number of children around Brisbane. Individual families are taking part, as well as children from schools and childcare centres, including St Joseph’s Catholic Primary school in Bardon, St Peters Chanel Primary School and C&K Rosalie Community Kindergarten and Preschool. Once the parcels are all collected, Sabre’s family plans to take a 2500 km round trip to deliver the parcels during the upcoming school holidays. The journey will involve more than 24 hours of driving, with stops in Charleville, Longreach and Emerald. “We are planning on leaving during the school holidays and driving out to Charleville to make the first delivery.” Ms Yip said. 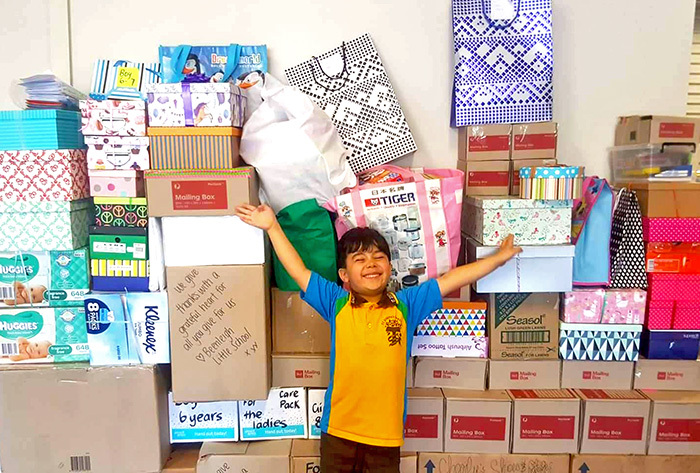 When Sabre and his family began the Parcels of Hope project, they contacted the Schools of Distance Education in Charleville and Longreach, as well as Charleville State Primary School and St Mary’s Catholic Primary School in Charleville to find out how many parcels they needed. Within four weeks they had officially collected more parcels than there were children to deliver them to. Ms Yip said the huge amount of support and donations led to an idea that enabled them to spread the love. “We’ve got things like nappies and deodorant, and just basically whenever they need to they can come and use it like a free pantry,” Ms Yip said. Parent liaison officer for the Charleville School of Distance Education (CSDE), Helen Cook, said while the school and district worked with many charities and organisations that wanted to support the drought-suffering families and communities, Parcels of Hope was the first that aimed its support specifically at the children. “We work with many different charities and organisations that wish to support drought declared families,” Ms Cook said. She said she had frequent contact with the families of students in her role as parent liaison office and knew which families were suffering as a result of the drought. Ms Cook said there were 72 students enrolled in CDSE who lived in drought declared areas of far southwest Queensland, some of whom had never experienced rainfall. “Some of our CSDE families have been in drought for six to seven years, and some of the younger students have never seen rain or rivers flow or green grass,” she said. Ms Yip said they had received so many parcels that they did not have enough space in their cars to fit them all, but had recently been offered help by a bus company to transport some of the larger parcels. She said the offer meant there was now no limit to the number of parcels they could collect and deliver. Ms Yip said while they were accepting parcels for children of all ages, a majority of those received so far had been for younger children, but that more parcels were needed for older children and teenagers. Ms Cook said the school had not yet informed the students or their families about the parcels and said she believed they would have a larger impact if they were received as a surprise. “The CSDE families have been very humbled and grateful for any support that they are receiving from people who are living in the larger cities or towns,” she said. If you or anyone you know would like to send a parcel to a drought affected child or family, you can find all of the information on how to donate on the Parcels of Hope Eventbrite page.